Bring a pot of salted water to a boil and add the snap peas. Cook for 1 minute, stirring constantly and then drain and dump the peas into the ice water to stop the cooking and set the color. Cut the snap peas in half at a 45 degree angle. Cut the cucumbers at a 45 degree angle, turning it a quarter turn after each cut. 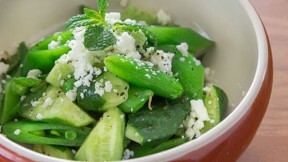 Add the snap peas, cucumber and mint to a bowl. In a small bowl, whisk the lemon juice, olive oil and salt together. Pour the dressing over the vegetables and toss to coat. Grind some black pepper on top and then add half the feta. Toss to distribute evenly. Plate the salad and sprinkle on the rest of the feta. This salad needs to be served immediately or the lemon juice will make the snap peas lose their color.